LSAT tips on how to study and test day. LSAT Tips from a veteran Kaplan LSAT instructor. Be bold enough to change your approach. Think about the future (focus on mistakes as an opportunity to improve). Start your study sessions with a strength. Be proactive in engaging with teachers. LSAT Tips Courtesy of Kaplan. Find Kaplan classes near you. While the LSAT is not a test of academic knowledge, such as legal history, taking the right classes can help polish the mental skills the LSAT tries to measure. For example, courses in philosophy, ethics, history, literature, and political science will improve your reading comprehension and reasoning skills (for the Logical Reasoning and Reading Comprehension sections). Taking classes in formal logic may offer some help in the Logic Games section, but intensive LSAT preparation is still the most effective way to improve your performance on this section. 2. Don’t expect to get everything right! You don’t need to respond correctly to every question to attain a “perfect” score of 180. In fact, you can get 2 or 3 questions wrong. If you get 75% of the LSAT questions correct, you will score higher than 90% of all test takers. If you get 50% of the LSAT questions correct, you will score higher than 40% of all test takers. In the last minute before the test is over, make sure to hurry back and fill in all of the answer bubbles! There is no penalty for incorrect answers, so you have nothing to lose by filling in all the bubbles randomly. If you have to fill in 10 bubbles, the odds are that you will get two right. That could make the difference between a score of 157 and a 159. Even a good LSAT score (75th percentile) only requires answering 65% of the questions correctly. The optimal approach for most test takers may be to slow down. Rather than hurrying through the sections to “see” all of the questions, you are better off answering fewer questions and giving each a full effort. Many questions have “trap” answers specifically designed to catch students who hurry through the test. All the LSAT questions have the same value. The hardest questions will count just as much toward your final score as the easiest. Skip the questions you are least comfortable with. (Note: when you “skip” a question, always make sure to fill in all of the bubbles, as per rule #2). Generally, the difficulty level of questions increases as the section progresses: question 22 will usually be harder than question 1. We get into specific timing and skipping strategies in our free prep course. How does Tiger Woods, one of the most successful golf players of his generation, prepare for the high-stakes/high-nerves game of golf? He always tries to practice exactly as if it were a real tournament. When you practice for the LSAT, use the same approach. Try taking the entire test, just as you would on test day, not just one section at a time. Practice at a desk (preferably in the morning) in a crowded room, just like test day. The key strategy to answering questions is P.o.E. (process of elimination). In the Reading Comprehension and Logical Reasoning sections, many of the answer choices can be justified with some “creativity”. It is a much better strategy to focus on why answers are wrong rather than why they are right. Skim through your choices and cross out answers that are clearly incorrect or have flaws. If you can eliminate two of the choices, you can increase your chances of getting the right answer dramatically (from 20% [1 in 5] to 33% [1 in 3]). The LSAT test day is over four hours long. If there is anything it measures, it’s raw determination. Practice. Practice. Practice. Students who get the highest LSAT scores spend at least 50 hours preparing. 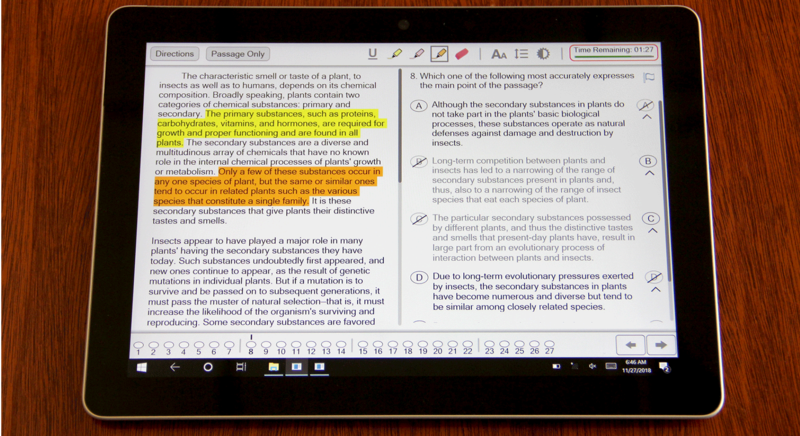 The July LSAT will be digital.